The story takes place in an alternate universe, where South Korea is a constitutional monarchy in 2018. A musical actress named Oh Sunny (Jang Na Ra) suddenly becomes a “modern Cinderella”, forced to marry the emperor Lee Hyuk (Shin Sung Rok). In search of true love and happiness, she must fight for her way in the palace and ultimately overthrow the ruling family. 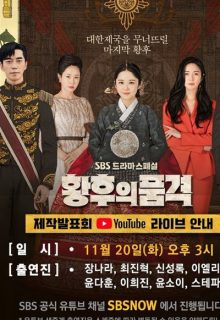 Meanwhile, Na Wang Shik (Choi Jin Hyuk) is a mysterious palace guard who helps Oh Sunny to take revenge on the ruling family. O gosh!! Cant wait for the eng sub 🤗..
It’ll air only 2 episodes this week on 17th of January, can’t wait to watch it. Thanks for subbing! When will the ep 22 air? Please watch my video of the emperor and oh sunny.